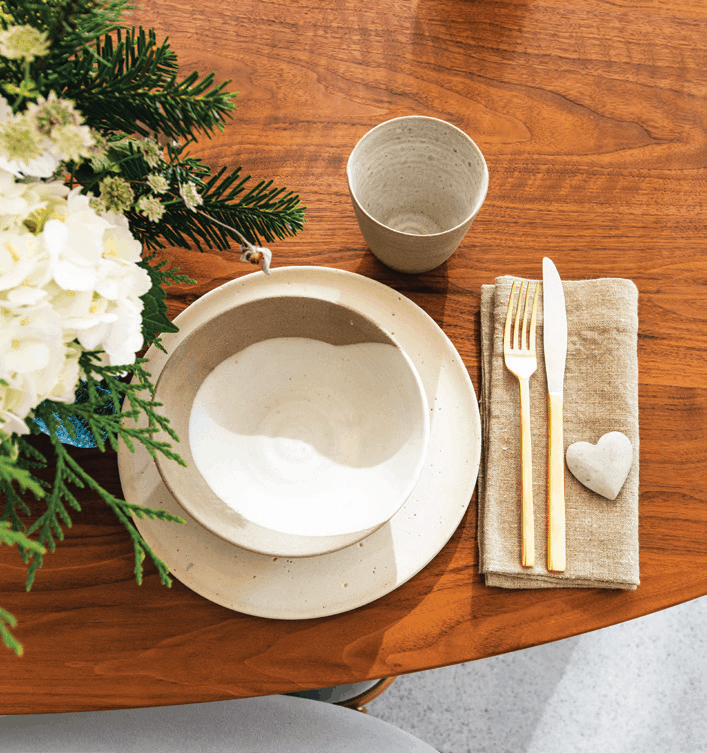 For this issue’s Refresh, the idea was to create a simple yet stunning dining room with plenty of textural details. 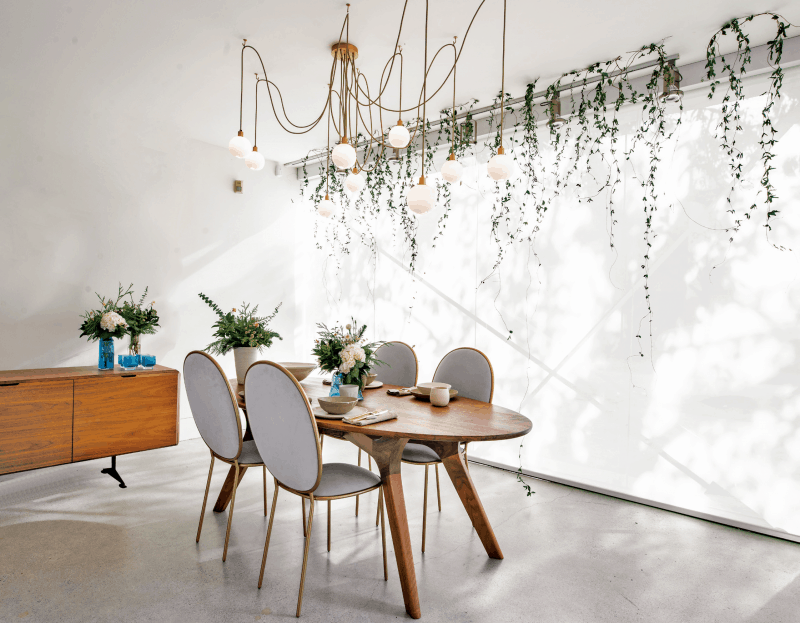 This dining room showcases textural simplicity at its best. 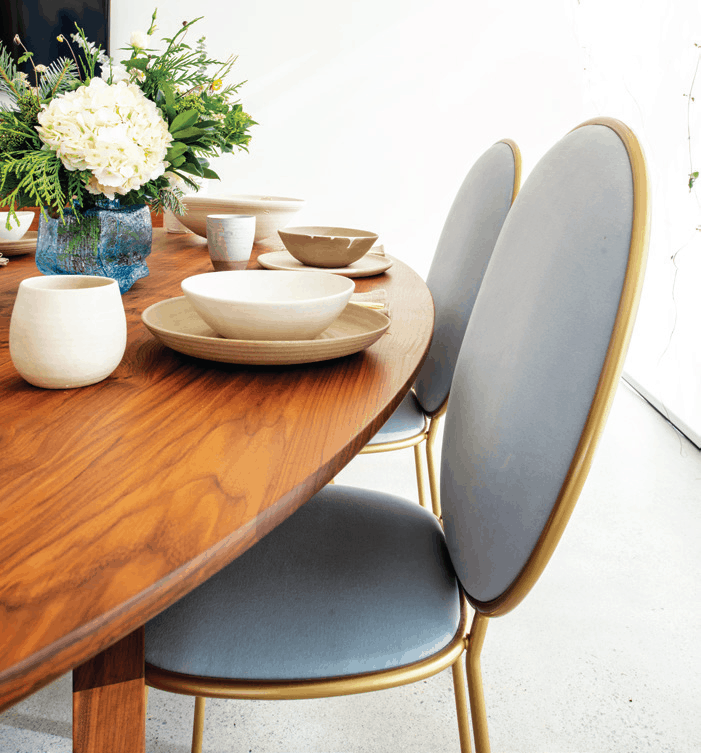 The gorgeous walnut Franklin Dining Table by Jay Miron with its architectural legs, was the starting point for this design. To offset the wood of the table, Karla chose the Stay Dining Chair from the SE’ Collection III by Designer Nika Zupanc. The round velvet back and gold trim details add a luxurious feel to the space and repeat the gold of the Drape Hook Pendant by SkLO. Douglas Glass vases by French Designer Francois Azambour on the table and on the Emerald Credenza by Sholto Design Studio offer a subtle pop of color. 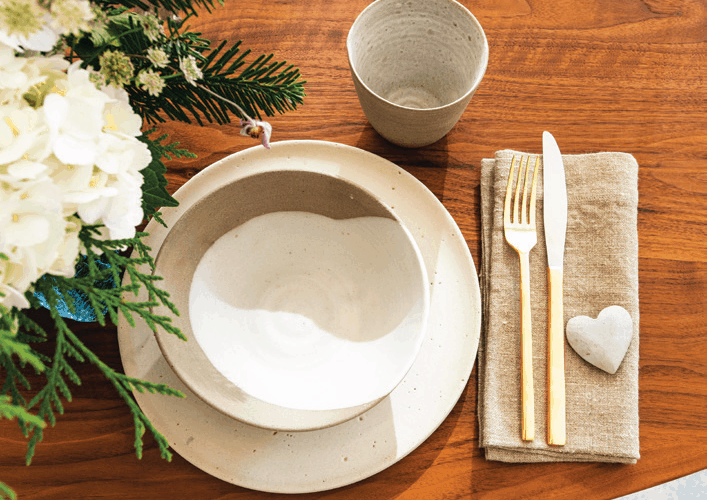 For the table setting, Karla chose pottery by Janaki Larsen. 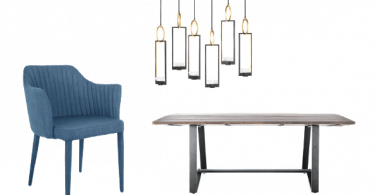 Each unique, handmade piece adds a textural element to the space without taking away from the art of the furniture. Keeping with the maker element of the space, Karla chose thick linen napkins and added gold cutlery for a touch of glam. 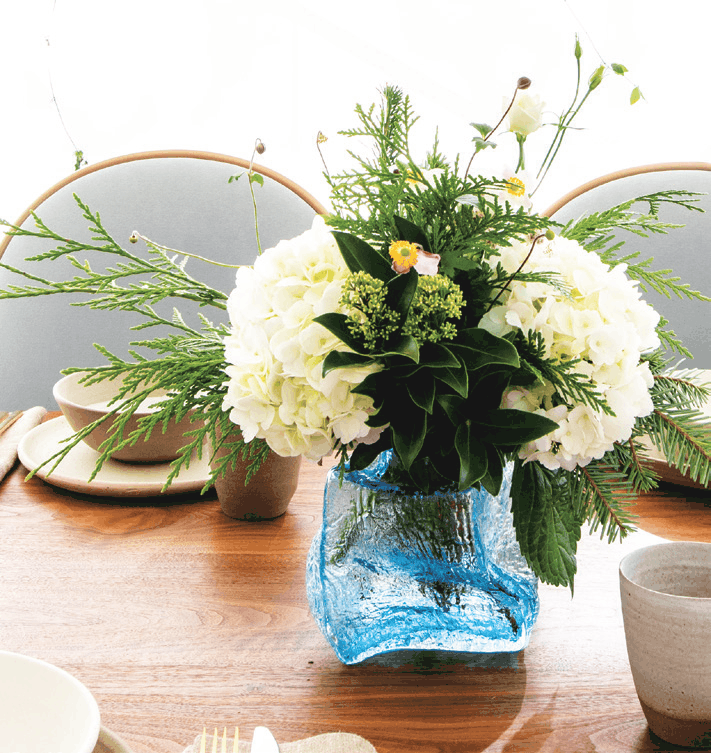 Floral arrangements from Our Little Flower Company focused on greens softened with white hydrangeas. They bring life to the space for a look that is festive but works even after the holidays are over. 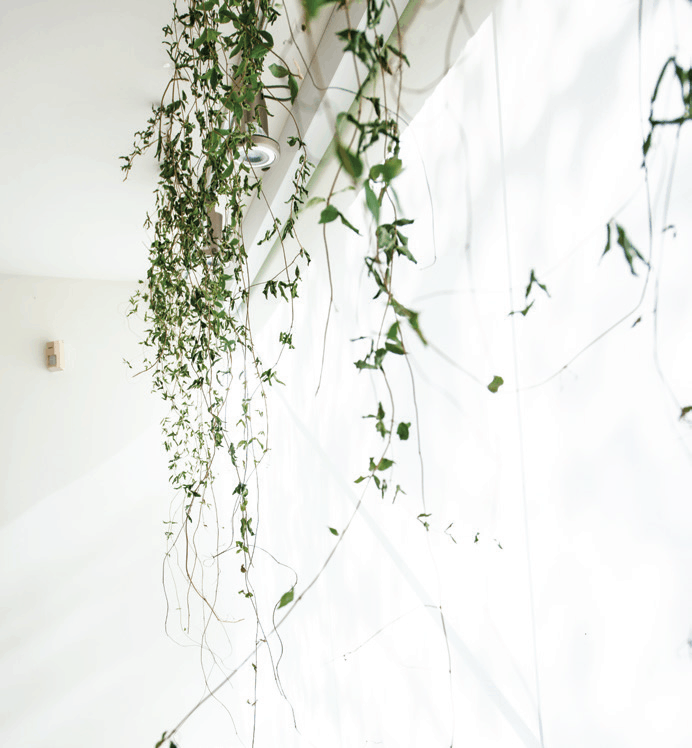 One of Karla’s favorite features of the space is a display of vines hung from the ceiling that adds an ethereal look. Karla is an award-winning Interior Stylist who believes in living authentically at home and in life. Her work has been featured in ELLE Magazine, Style at Home Magazine, Rue Magazine, Design*Sponge, Western Living, Modern Sanctuary and Vancouver Magazine. She is a regular guest expert on City TV’s Breakfast Television, CBC, produces the reoccurring “How to Style” series on the Marc and Mandy Show, and for Canadian Home Trends Magazine. 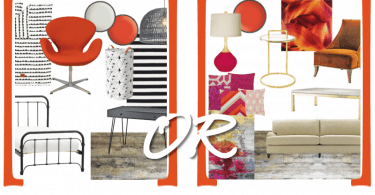 She has been awarded Best of Houzz Design, Customer Service, and the Influencer Award. She also produces a weekly You-Tube Show with Design Tips & DIYs. This is so classy. Love the use of gold and light blue. Love all the plant material in this.